Electric Picture House Artist's Co-operative are pleased to announce the exciting official opening of their new artists studios, workshop and exhibition space in Congleton, Cheshire. 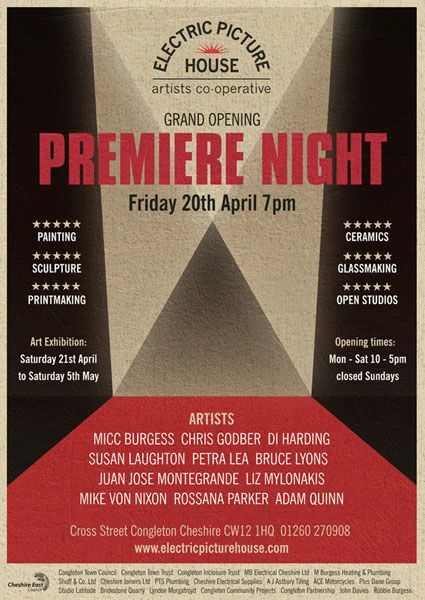 In keeping with the buildings former use as a cinema the artists will be holding an Arts Premiere on the FRIDAY 20TH APRIL 2012 to officially open the building and launch an exhibition of the groups work. After months of hard work an 'all star cast' of artists will be rolling out the red carpet and inviting everyone to their open studios and exhibition of painting, sculpture, new media, print, glass and ceramics. There will be popcorn, usherettes and films about the project. Artist and Gallery Manager Petra Lea says " We are really looking forward to officially opening our doors to welcome everyone to our grand opening night. It is our aim to create an inspiring and supportive venue for artists and the local community and we hope this event will give people a taste of that." There are 11 artists, 9 studio spaces, a workshop and central gallery/community projects space. As well as holding exhibitions the group will be organising community workshops and projects throughout the year focussing on summer projects for children and students.